The Knight Foundation News Challenge selected theDataMap as a 2016 recipient. With these funds, theDataMap will extend health and mobile data as well as include all forms of personal data by providing numerous ways for the public to participate. Latanya Sweeney, as Chief Technology Officer at the U.S. Federal Trade Commission, led a group of summer research fellows, Jinyan Zang, Krysta Dummit, James Graves, and Paul Lisker, at the FTC in a project to survey data sharing from 110 popular free apps. We thank the FTC for allowing the information to be reported publicly. The documented flows contributed mobile data to theData Map. John Bender, Cynthia Maria Ivey, and Aaron Reinert, graduate students from the University of Texas, studied health breach notifications from 2005 to June 2013 to identify organizations holding personal health information. 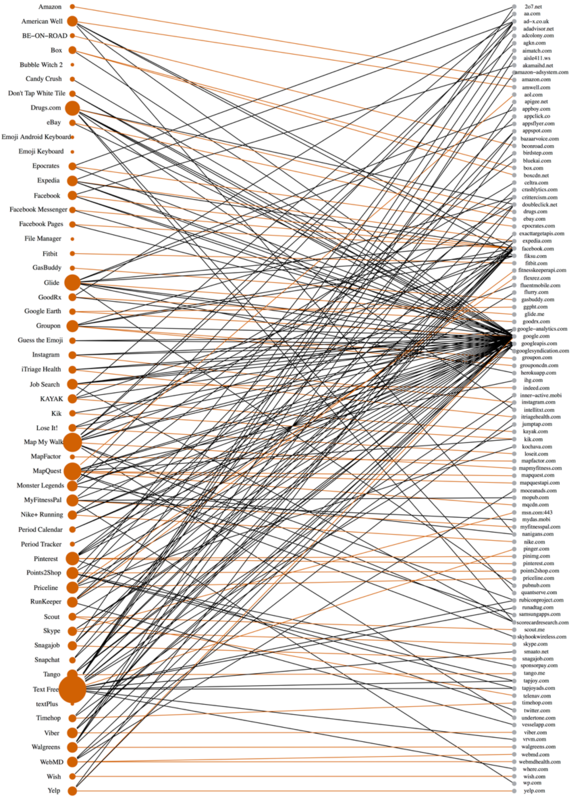 Their study documented an additional 1146 organizations and 18 categories to theDataMap. The highlighted categories below show categories added by this team. Jordan Robertson, a reporter with Bloomberg news, made public record requests for state discharge data to identify organizations acquiring statewide collections of patient specific medical records. 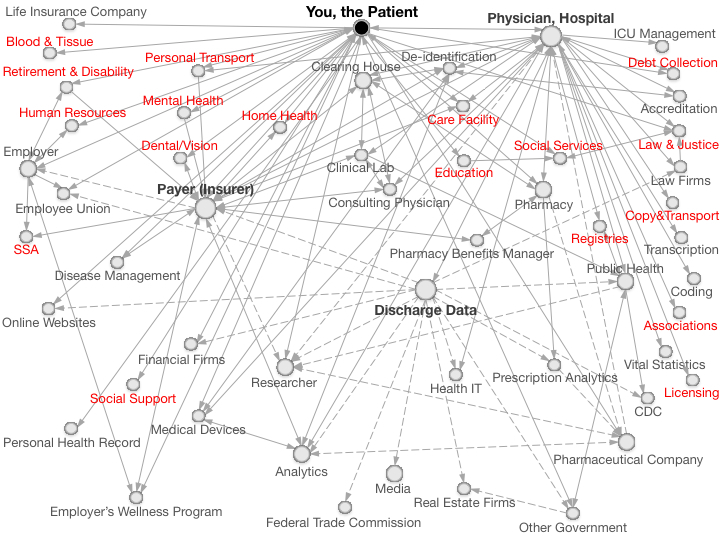 Responses documented an additional 1108 organizations and 9 categories to theDataMap. The highlighted categories below show those added. Latanya Sweeney, Akua Abu and Julia Winn conducted an experiment that put personal names to people who uploaded their medical and genetic information to an online public repository. 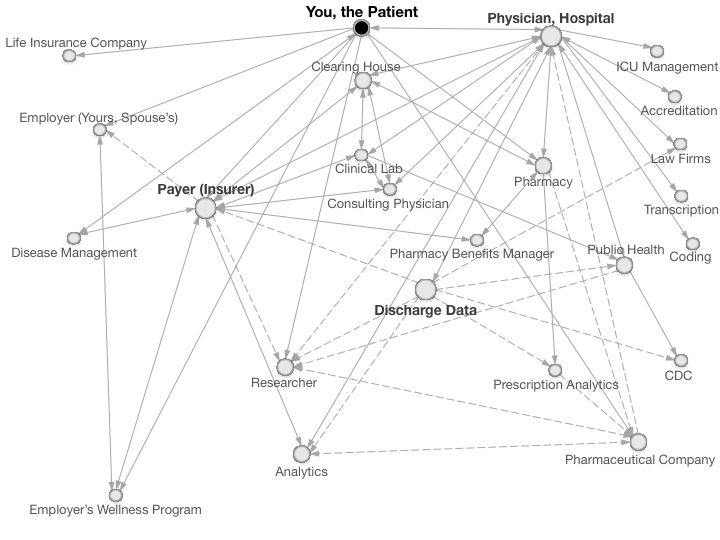 The study documented an additional 3 organizations and 2 categories to theDataMap. Additionally, Latanya Sweeney added the de-identification category based on her work with Privacert.com. The highlighted categories below show those added. 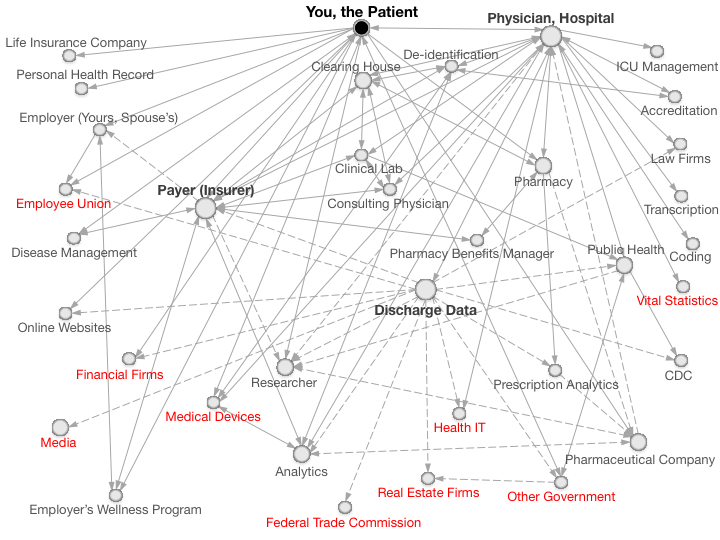 As a GAO appointment to the Federal Health Information Technology Policy Committee, Latanya Sweeney constructed a datamap to document sharing of personal health information based on her ad hoc experiences to inform discussions The goal was to compare the map with that done in 1997 (see below). She found a significant number of new categories. The image below depicts the 2010 datamap. Paul Clayton and a committee from the National Research Council published a book, For the Record: Protecting Electronic Health Information, that examines privacy concerns in health data. 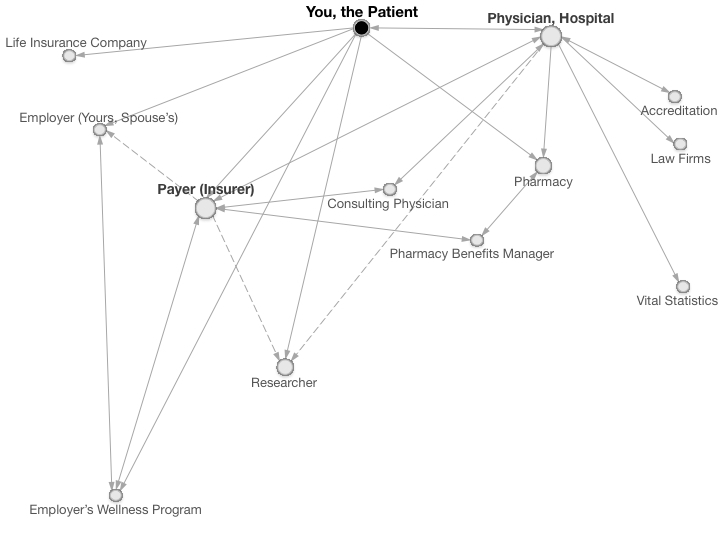 Within their book is a map that shows the places personal health information flowed from a typical, but hypothetical patient at the time based on the ad hoc knowledge of committee members. The image below depicts their original 1997 datamap.